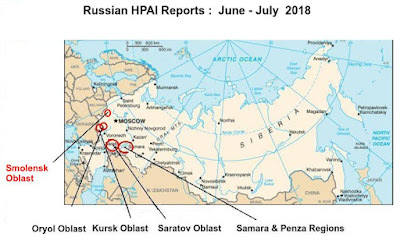 Over the past 3 weeks we've been following official (Rosselkhoznadzor) and media reports of HPAI H5 outbreaks in poultry farms (see here, here, here, and here) across a wide swath of Western Russia. While I've not found any official statement on the Federal or regional Rosselkhoznadzor websites this morning, local media in Smolensk Oblast are now reporting outbreaks in at least two villages. Official notification is sometimes delayed until confirmatory tests are conducted, and given Russia is currently hosting the World Cup, local officials may not be particularly eager to advertise the situation. Two (translated) media reports follow, after which I'll return with a bit more. On the territory of the district Elninskaya registered foci of avian influenza. The virus was discovered in the backyard in the village and in the village Korobets Pronino. The diagnosis was made the regional veterinary laboratory, but eventually it will be confirmed only after the inspection of the Federal Center for Animal Health. To prevent the spread of the disease, marked boundaries of the possible infection of the hearth in a radius of 5 kilometers. According to preliminary data, it is necessary to destroy the three thousand birds on private farms. The infection can be transmitted to humans through direct contact with sick birds. As described in the administration Elninskaya area in munipalnom Education passed an emergency meeting of the Commission on prevention and liquidation of emergency situations and fire safety, which addresses issues related to avian influenza. On the territory of the district in the village Elninskaya Korobets (street and Kazubskogo Syrzavodskaya) and village Pronino (Central Street) registered centers of avian influenza. The boundaries of the epizootic outbreak threatened area within a radius of 5 km and a surveillance zone of a radius of 10 km from the border of disadvantaged areas. According to preliminary data, it is necessary to destroy the 3,000 birds on private farms. The assumption right now is that Russia is dealing with a relatively low-risk (to humans) H5N8 virus, but the OIE has only identified it as HPAI H5. None of the official reports I've seen specify the exact subtype. 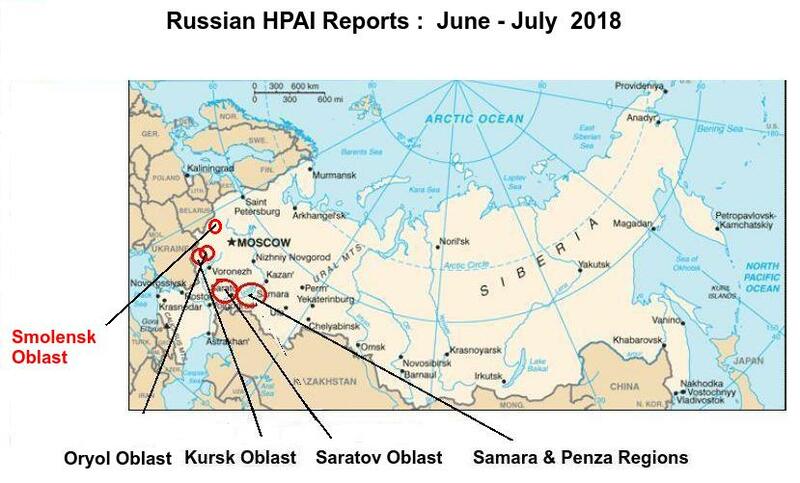 And as we saw last summer (see Rosselkhoznador: HPAI Contaminated Poultry Shipped To At Least 9 Regions Of Russia), some contaminated poultry products have reportedly been shipped to market, and efforts are underway to recall these items. This information was announced at a regional anti-epizootic commission. Quarantine Influenza introduced birds in Kursk, Samara, Penza, Saratov and Orel regions. Hit under quarantine 40 foci. There is a high probability of introduction of the virus into the territory of Kaluga region from neighboring areas. The source of infection are as sick and recover from domestic and wild birds. The virus can live in the body recover from the individual up to two months. Symptoms of the disease can be found here . When detecting signs of disease in birds should be reported immediately to the veterinary service or the emergency services by number "112". 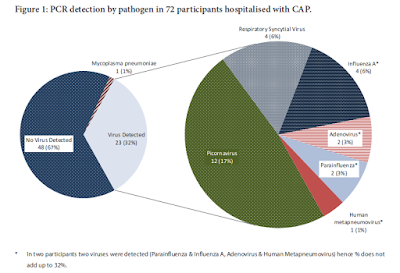 The return of avian flu to Western Russia after a six-month lull is not unexpected, as HPAI H5 viruses over the past couple of years appear to have developed greater persistence in wild and migratory birds, and can easily be reintroduced into poultry flocks. And given the constant migration and mixing of potentially infected birds around the globe, the avian flu threat doesn't appear likely to go away anytime soon.